Are you interested in whipping up some homemade dog food for your furry friends? In this article, we will share just how you can cook and serve chicken gizzards to your pooches. Homemade dog food is becoming more and more popular these days, due to the fact that when you know exactly what your pets are getting to eat you can be sure that they are eating healthy and nutritious food. And one ingredient that is suitable for dogs when it comes to their food is chicken gizzards. The gizzard is often found wrapped in parchment and stuffed inside a whole raw chicken, and in some cultures, they are considered to be delicacies. For the chicken, they take the place of teeth. They come packed with protein, which makes them excellent for the nutrition of canines, and as a bonus, they also contain zinc, iron, and vitamin B-12. 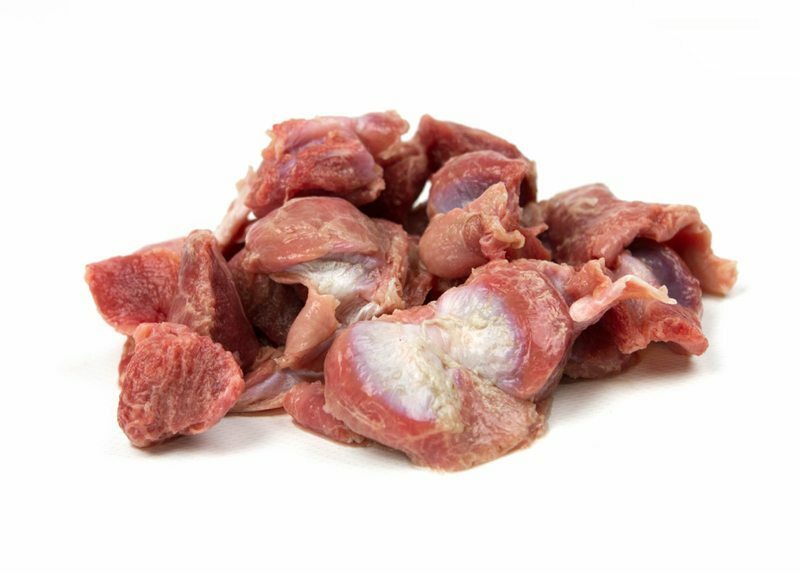 Gizzards also come packed with glucosamine, which is beneficial to your furry friends as it helps with arthritis issues and cartilage issues. However, it is worth mentioning that gizzards should be limited to roughly twenty percent of your dog's diet due to the fact that they are high in cholesterol. When you have your gizzards and you are ready to prepare them, rinse them well and then cut them. In order to have your cooking remain simple, place the gizzards into a saucepan, cover them with some water, and then place your heat onto medium. Cook for at least fifteen minutes, or until the gizzards have been thoroughly cooked through. After that, you want to remove them from the heat and allow them to cool. 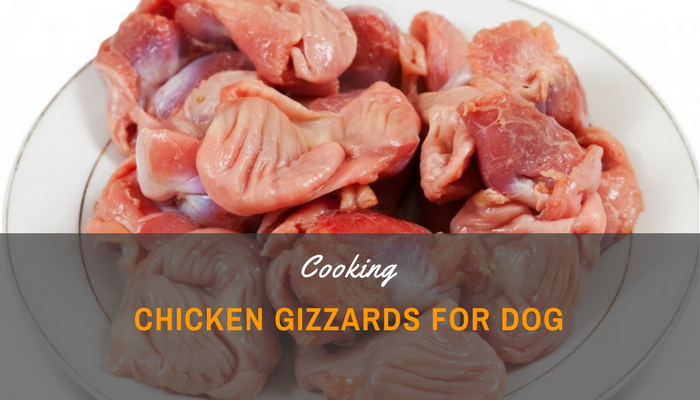 Keep in mind that gizzards are tough due to their constant use by the animal they come from, so in order for them to be digested easily by your dog(s), you will want them to be chopped fine or diced. This is especially important if you are introducing chicken gizzards to a dog that is new to eating them. Are you ready to whip up a delicious and well-rounded meal for your pooch using chicken gizzards? Well, grab the gizzards that you have prepped (about 4 ounces will do nicely) as well as 2 ounces of cooked rice, and 2 ounces of carrots that have been chopped. In a pot, bring 4 ounces of water to a boil and then add these ingredients. Stir often, and allow this mixture to heat and cook for fifteen minutes. After this, remove the food from the heat of the stove and allow it to cool. This recipe is packed protein, carbohydrates, and fats that are healthy and balanced well for your pet. The second chicken gizzards recipe that we want to share with you involves slow-cooking the gizzards, so make sure that you have a slow cooker handy if you want to try your hand at this recipe. Slow-cooking allows the gizzards to soften up and become easier to eat for your pooch. You will need one pound of chopped and raw chicken gizzards, one pound of chicken (that is raw and has been deboned), one cup of water, three large and chopped carrots, and four hard-boiled eggs that still have their shells (crushed). Place your slow cooker on low and allow this mixture of ingredients to cook for 2 or 3 hours. You will know that it is done cooking when the chicken falls apart easily. After this, you want to stir in two cups of white rice that has been cooked and one more cup of water. Allow this to cook for thirty more minutes and then let the entire mixture cool. It needs to be completely cool before it is acceptable for your dog to eat. This recipe is a grain-free one for those pet owners who are concerned about their dogs eating grain. For this recipe, you will need a stockpot. Chop up roughly three pounds of chicken gizzards and place them into your stockpot. Follow the gizzards with two cups of potatoes (chopped and peeled), eight cups of water, one cup of cold-pressed and organic apple cider vinegar, two cups of chopped carrots. Turn your heat to high, and get the mixture going at a rolling boil. After this, you will want to reduce your heat so that it is at a simmer and then cover it. Allow your stew to cook for one hour. After the hour has passed, remove your mixture from the heat and allow it to cool completely before you serve it to your pup. Chicken gizzards can also be used to whip up delicious dog treats. For this recipe, you will need one pound of gizzards, four or five cups of water (enough that the gizzards are covered), two slices of fresh ginger root, and one tablespoon of olive oil. In a saucepan, boil your water. Add your slices of ginger root and the gizzards and then return the water to a boil. After this, lower the heat and allow this to simmer for twenty minutes (uncovered). Throw out your ginger, and drain the chicken gizzards. Allow them to cool. Preheat your oven to 300 degrees. Line a baking sheet with some parchment paper. Cut your gizzards into thin slices and toss them with your tablespoon of olive oil. Arrange them on your baking sheet, and once the oven is ready, let them bake for one hour (turn them over after thirty minutes, however). Once they are done baking, let the treats dry in the oven for another hour. Store your treats in an airtight container in the refrigerator, and feed them to your dog within two weeks. In conclusion, chicken gizzards are inexpensive and they are an excellent ingredient used in homemade dog food. If you are ready to try your hand at homemade chow for your pup, give one of these fantastic recipes a try. Not only will you be able to feel good about the nutrition your dog is getting, they will be able to enjoy a tasty meal. Take care your pet successfully!